Blackbird Presents is proud to announce Nathaniel Rateliff & The Night Sweats will headline the sixth annual ‘Second Weekend at the Saenger’ Concert Series. This unforgettable concert is set to take place on Friday, May 3rd at the Saenger Theatre in New Orleans. On Friday, May 3rd, Foundation of Funk featuring founding members of The Meters, Zigaboo Modeliste and George Porter Jr., keyboardist/vocalist Ivan Neville, Tony Hall, and guest star Anders Osborne, will kick off the evening, followed by a full set from Nathaniel Rateliff & The Night Sweats. Emeril Lagasse will prepare a pre-show reception for Gold Circle ticketholders, which will also include a special acoustic set from Nathaniel Rateliff. Some other very special guests will also join the show. The LA Times calls Nathaniel Rateliff & The Night Sweats “one of the most thrilling arrivals of recent years, its reputation stoked considerably by the group’s incendiary live shows.” The group lean heavy into R&B and soul with a garage rock edge on the band’s eponymous debut and 2018’s Tearing At The Seams. This is a Marigold Project Event. A portion of the proceeds will go to the Emeril Lagasse Foundation and The Send Me A Friend Foundation. 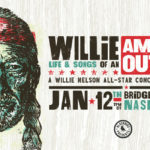 Tickets go on sale Friday, February 15th at 10 AM CT via Livenation.com, by phone at 800-745-3000, and at the Saenger Theatre Box Office, and are being offered at a variety of price ranges. This show continues Blackbird Presents’ annual “Second Weekend at The Saenger” concert series. Previous events include Ryan Adams: Exile On Bourbon St., New Orleans Is Waiting For Columbus, The Last Waltz New Orleans: A Celebration Of The 40th Anniversary of The Last Waltz, Nevilles Forever: A Celebration of The Neville Brothers and Their Music, and The Musical Mojo of Dr. John: Celebrating Mac and His Music.